The Mérieux Foundation research teams are a key resource for expertise in infectious diseases. Research programs are mainly focused on respiratory infections, including tuberculosis, and enteric infections, including typhoid fever. They aim to reduce the morbidity and mortality associated with these infectious diseases in low-income developing countries. Key areas include clinical and epidemiological studies, antimicrobial resistance and the development, validation and implementation of new diagnostics. In addition, a program is being conducted on hemorrhagic fevers in our Jean Mérieux Laboratory, a biosafety level 4 (BSL-4) containment laboratory located next to the Emerging Pathogens Laboratory, which is owned by the Mérieux Foundation and managed by Inserm, the French national biomedical and public health research institution. conduct multicenter clinical and epidemiological studies on targeted diseases. As part of these activities, we began an ambitious quality assurance program to acquire international ISO 15189/17025 accreditation for the GABRIEL laboratories. 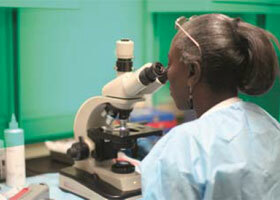 The laboratories in Laos, Paraguay, Mali and Haiti are the first GABRIEL members participating in this program. Rodolphe Mérieux Laboratories provide state-of-the-art BSL-2 and BSL-3 research platforms in low-resource countries. Built with the support of Fondation Christophe et Rodolphe Mérieux, an independent family foundation working closely with the Mérieux Foundation, they are located in Madagascar, Mali, Haiti, Cambodia, Laos, Lebanon, Bangladesh, and Brazil. The Rodolphe Mérieux Laboratories are members of GABRIEL and form a unique network for applied, clinical and epidemiological research with core support from the Mérieux Foundation’s laboratories in Lyon and Beijing.